COLUMBUS-The Senate passed legislation today, sponsored by State Senators Bob Hackett (R-London) and Peggy Lehner (R-Kettering), aimed at smoothing the employment transition for military husbands and wives who relocate to Ohio with their active duty spouse. COLUMBUS-Ohio Senate President Larry Obhof (R-Medina) today named State Senator Bob Hackett (R-London) as Chairman of the Senate Insurance and Financial Institutions Committee for the 133rd Ohio General Assembly. COLUMBUS-The Governor today signed Senate Bill 220, sponsored State Senator Bob Hackett (R-London), to create an incentive for businesses to attain a higher level of cybersecurity through voluntary action, creating better protection for their customer information. COLUMBUS-The Senate passed legislation today, sponsored by State Senator Bob Hackett (R-London) and Jay Hottinger (R-Newark), which will help address Ohio's prescription drug abuse epidemic and fill gaps in care delivery to patients battling addiction. COLUMBUS-On Wednesday the Senate passed legislation, sponsored by State Senator Bob Hackett (R-London), to create an incentive for businesses to attain a higher level of cybersecurity through voluntary action, creating better protection for their customer information. COLUMBUS-State Senator Bob Hackett (R-London) today applauded the recent announcement made by Amazon to open its sixth Ohio fulfillment center in West Jefferson, Ohio. The new facility is projected to create more than 1,500 full-time positions in addition to the existing 6,000 Ohioans currently employed by Amazon. COLUMBUS-On Wednesday, State Senator Bob Hackett (R-London) joined Governor Kasich and a coalition of state leaders to discuss legislative efforts aimed at battling Ohio's drug epidemic through prescription drug reforms. COLUMBUS-State Senator Bob Hackett (R-London) today announced the Ohio Department of Agriculture is now accepting proposals for the 2018 Specialty Crop Block Grant Program, which will provide funding for projects to enhance the competitiveness of crops such as fruits, vegetables, nuts and nursery crops. 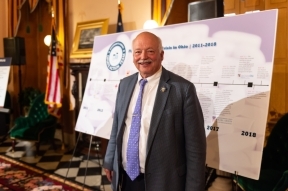 COLUMBUS-The Greater Cleveland Partnership (GCP) and its small business division and the Council of Smaller Enterprises (COSE) today named State Senator Bob Hackett (R-London) the 2017 Small Business Advocate of the Year. 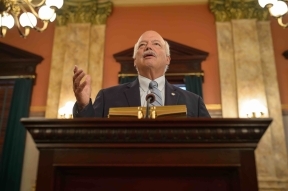 COLUMBUS-State Senator Bob Hackett (R-London) today announced the introduction of the state's Capital Budget, a $2.62 billion investment in Ohio's infrastructure and local community projects.